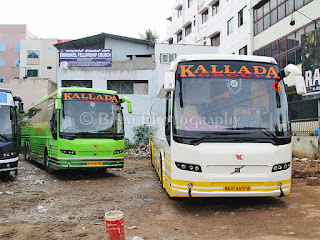 Kallada G4: Bangalore to Thrissur.. G4 after long.. The third Saturday of June - my traveling weekend. I had planned to head to Chennai that weekend, of course for another round of the Monster Fever. But there was something else in store for me - an invitation for a Seminar in Trivandrum - a chance to meet my beloved teacher. I thought of tweaking the Chennai trip and heading to Trivandrum from there.. but as usual, a call home, and the route was changed to via Kodungallur now. 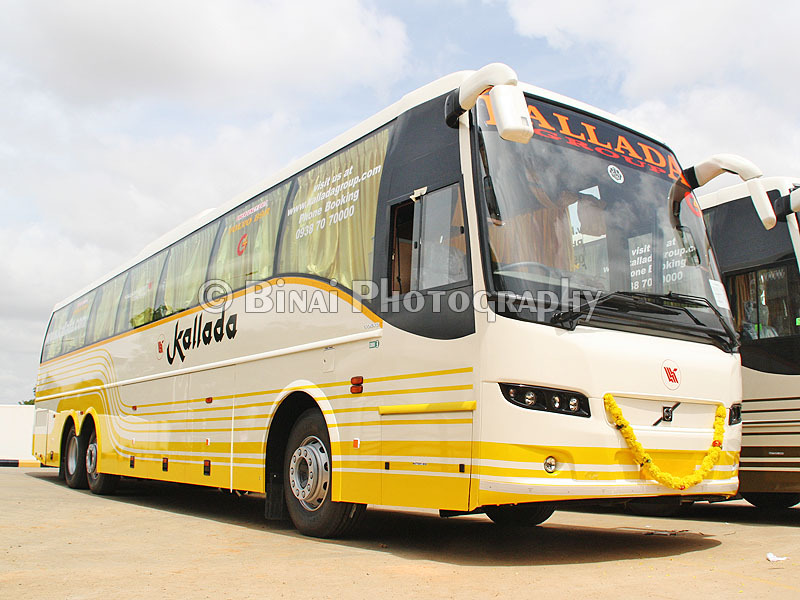 Deciding the operator to take was also a no-nonsense work - it was Kallada G4 this time, after a long long gap. My last journey with them was in January this year - a good 6 months gap since. Just dropped in to Friend's Travels, and got a seat blocked. Booking my return ticket was a bit tricky - that comes in another post. College was eventless - reached home at my usual timings. Spent some time with my niece. In all the melee, I got late for dinner. I left home at 2130hrs for a bus departing at 2200hrs, that too on a Friday night! Sure recipe for disaster. Just as my bro took the car out of the parking lot, the building's exit was blocked by an auto - it took some more time to get the old driver of that auto to take the vehicle out and clear the exit. Then traffic on the road - I could feel my heart beat faster. It was 2150hrs by the time we reached Hosur road - I was praying that there shouldn't be a traffic block anywhere. By the time we passed Silk Board, I got a call from Friends travels asking about my whereabouts - he asked me to hurry. Thankfully, there was no traffic anywhere on my side, while the opposite side was jammed up totally. My brother dropped me at the pump exactly at 2200hrs - my bus was waiting there for me - ready to leave. I hurriedly got off the car and ran to the bus. The bus: KA-01-AB-5738. Photo taken during delivery @ Volvo, Hoskote. G4's Rajeevettan was standing there - told a hi, just when out DJ called up - he too was right behind. After quick hellos, I got into the bus. Our beloved Ticket checker too was on board - my seat was changed from a left side window to a right side window - I loved it. The bus was full already - me and a couple more passengers were the ones missing. Finally, after a quick checking, the bus was signalled to move at 2205hrs. Some little confusions, and another headcount, we were off at 2209hrs - 9 minutes late. In the mean time, they started playing a movie - a fairly recent malayalam movie, directed Guiness Pakru. The bus took the Madiwala Market route instead of taking a U-turn at St. Johns. It was heavy traffic then on - the bus will move for some time and then take rest for some time. We were accompanied by a lot of TN buses - and all of them were full as well. We passed Silk Board at 2232hrs - a good 23 minutes just to cover 3.5kms! We crossed a Suresh Kallada Hyderabad bus at Silkboard - not sure which service was that (Kanyakumari or Trichy). Once past Silk Board, the driver picked pace. He did not overspeed on the BETL, but maintained fairly decent pace. We passed Attibele at 2257hrs. After Attibele, traffic was slightly on the higher side, but we still passed Hosur at 2310hrs. Since all seats were taken at Madiwala itself, there were no stops anywhere. 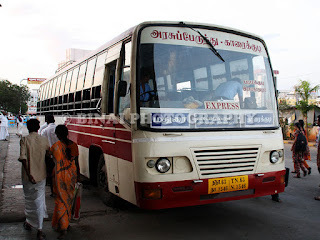 After Hosur, the bus turned towards Rayakottai. The driver maintained fairly good pace throughout the run. I slept sometime around midnight, as soon as the movie got over. I had a night sleep from then on. I was woken up by sounds of rain drops pelting on the side windows - it was around 0355hrs then, and we were stationary at Walayar then. It was raining outside. I still decided to get off the bus and take a stroll. It was only drizzling then. 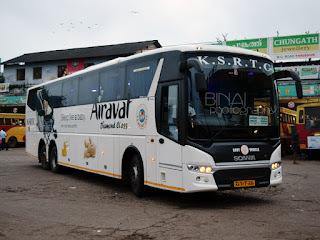 The G4 Pathanapuram Volvo was just leaving from Walayar then. 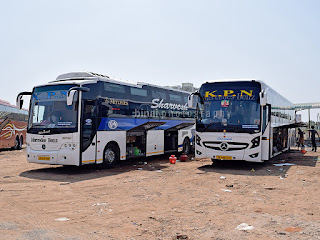 One SRM Volvo B9R (Thiruvalla bus) and the Bharathi B9R were standing there as well. I got back into the bus quickly - it started raining again, and it was slushy all around. We started moving at 0401hrs. By then all the others were gone. The rain started strengthening as we neared Palakkad. I dozed off for some time - woke up when the cleaner came around calling for Palakkad passengers - the lights weren't switched on, and he was actually near two passengers who were to get down at Palakkad. They were dropped outside Tipu Palace, at 0429hrs. I had a nice sleep after Palakkad - but I understood that we were on the regular route via Shoranur. I could hear the rain all through the journey - it was literally pouring all the time. I was drifting asleep on-and-off - vaguely remember running past Mulagunnathukavu, near Thrissur. I finally woke up just as the bus passed through Ashwini Hospital Junction in Thrissur. I straightened my seat, and got set to get off. Woke up my co-passenger, and got off the seat as the bus was passing by Vadakke stand. By now many more people realised that we were in Thrissur already. On the way to the cabin, I picked up my baggage from the overhead rack, and pulled out the umbrella. It was still pouring outside. The bus finally stopped outside General Hospital in Thrissur round, at 0550hrs. A sweet 7h41m ride from Bangalore to Thrissur, despite pouring rain. End Notes: The bus was KA-01-AB-5738 - this bus was delivered on August 17, 2012 - your's truly had covered the delivery event. She has clocked 1.97 lakh kms since then - that is in about 10 months. 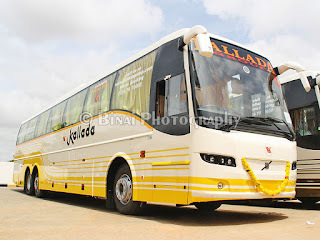 Maintenance was the usual Kallada G4 class - no rattles (except occasional rattles from the AC blower - volume controlling rings). Driving was excellent - no rash cuts, absolutely no use of horn at night. I loved the appearance of the drivers - in full white uniform complete with an identity card! It all gave an excellent feeling. The blankets (Rather, shawls) did not appear to be in great condition - time to replace them. I hope they replace them with proper blankets, and not the narrow shawls the next time. The last time G4 had disappointed me with their punctuality, and a lot of errors on their website - which misled me and made me believe the bus leaves earlier than its actual time. I haven't used G4 since - I took a 6 month break from G4, and decided to give them another chance - did not really disappoint me. But I feel they are losing steam - they had set some standards - I feel they shouldn't dilute those standards. Friends Travels deserve special appreciation - they make sure the buses leave on time, and I just love the way their staff behave to passengers. Will I take this service again? Surely! G4 does a great job in the Bangalore-Kerala routes - not sure of their consistency in the opposite direction.